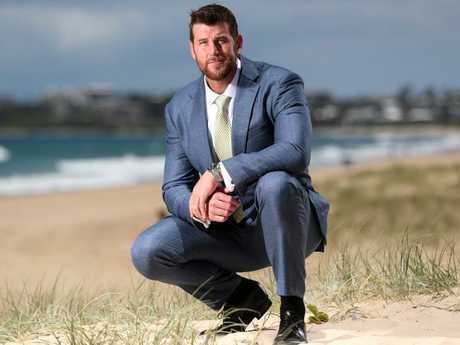 DECORATED war hero Ben Roberts-Smith has declared troops under extreme fire would have a better chance of surviving if Malcolm Turnbull procured war machines from a company that has staked its future in Queensland. 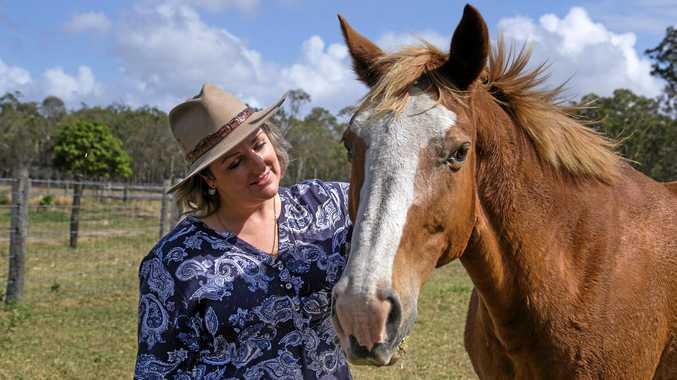 The rare intervention from the Victoria Cross recipient now puts Queensland in an enviable position to win the $5 billion Land 400 contract, and places fresh pressure on the Turnbull Government. 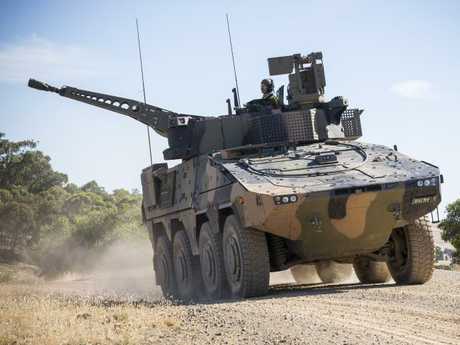 Sunshine Coast-based Mr Roberts-Smith - who said he would not tell the Prime Minister or others what do to because "they are going to have to live and die by their own decisions" - said Rheinmetall's Boxer CRV offered more protection over BAE Systems Australia's armoured vehicle. "Team Queensland", Mr Turnbull's 26 LNP parliamentarians, and state and federal MPs in Victoria, are each demanding the contract, which will lay the foundation for a further $15 billion investment under Land 400's next phase. A Rheinmetall Boxer CRV participating in the Land 400 Risk Mitigation Activity. 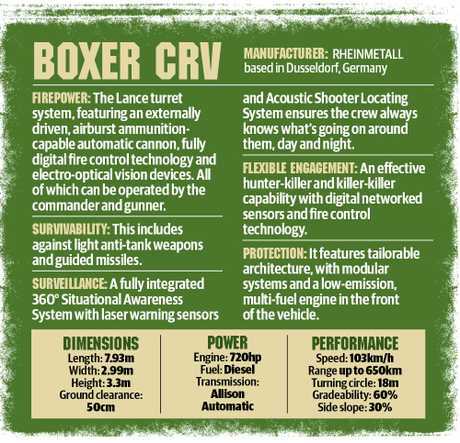 If Rheinmetall's Boxer CRV wins the project, it will build 225 state-of-the-art combat reconnaissance vehicles in Queensland. 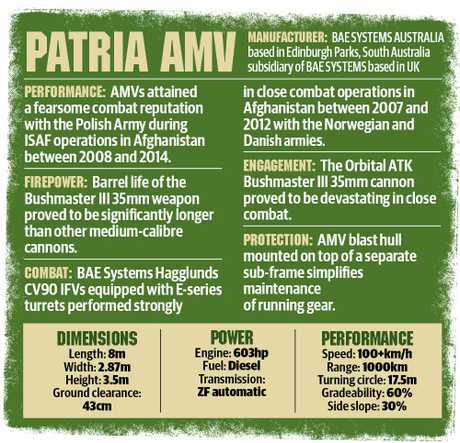 BAE will build its Patria AMV35 in Victoria. Mr Turnbull, who has launched an unofficial offensive in Queensland to sandbag marginal seats at risk to Labor and One Nation, has refused to reveal who he believes should win the contract. The Defence Department will submit its views to the National Security Committee within weeks after months of rigorous testing. The announcement could be made in the May Budget, which is potentially the last before the Government sends voters to an election. At pains to express that he was only offering his opinion, Mr Roberts-Smith said there was no doubt which armoured fighting vehicle offered better protection. "You've got to think about the future of modern warfare and the threats we're going to face,'' Mr Roberts-Smith exclusively told The Courier-Mail yesterday. "What we've got with the Boxer, it is well known for being the most protected vehicle. So in terms of survivability and the people using that vehicle, the Boxer CRV is the best in the world in terms of that category of vehicle. "The ADF itself in putting out this tender has kept protection as the number one priority. So if you were looking at the these two vehicles, you will get better protection from the Boxer. "So when you look at all the different aspects they're (Defence) looking at, whether it's protection, lethality, mobility or sustainability, protection is number one. "In layman's terms, it (the Boxer) has more armour on it. So it's got more ballistic protection, which means it can take or sustain a bigger hit." "One of these light armoured vehicles or reconnaissance vehicles will certainly come up against an IED, explosive or projectiles, heavy calibre machine guns and rockets. The Boxer provides the best protection against that." He said the turret, which controls the cannon, was most advanced in the world, and its skid steering provided it with an edge. "I'm talking about my experience and more perspective and I'm not an expert (but) going over all the data I've been given, and looking at all the testing that's been done on the vehicles, particularly the blast testing that was done, the Rheinmetall Boxer performed better than its opponent,'' he said. "It is the more protected vehicle. It's just that simple. "I would not hazard to put myself in a position of telling the Prime Minister or anyone else what they should do. They are going to live and die by their own decisions. I think the Boxer is definitely providing us with the capability we need and keeping our troops as safe as they can safely be. "I'm still very connected obviously with the military and I do a lot of stuff for different units and Defence themselves. "I have a vested interest in it. I have a lot of mates who are still serving. "It's funny being on the other side. When you're out there you don't think about it or worry but when you're not out there you worry about your mates." Ian Bostock, the editor of Defence Technology Review and a specialist defence writer who has been reporting on Australian Defence Force equipment acquisition programs for the past 25 years, told The Courier-Mail there was no guarantee who would win the contract but said the Boxer had a better level of ballistic protection. "The Boxer CRV is seen by most as the more capable option. This, however, brings with it a higher sticker price than the AMV35,'' he said. "Both vehicles are about the same size, with AMV35 being several tonnes lighter due to having less armour. "Defence made it clear in the tender that the highest capability priority for the CRV is protection. On this basis, the Government might opt for Boxer CRV. "If, on the other hand, cost is the main driver then the AMV35 has a strong advantage," he said.